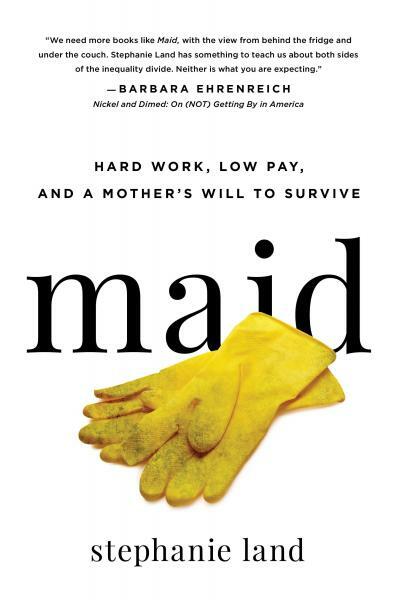 With these arresting words, author of the month, Stephanie Land begins her story of teetering on the edge of the poverty line in her book, Maid: Hark Work, Low Pay, and a Mother's Will to Survive. As a 28-year-old, Land had aspirations to move away from her Pacific Northwest hometown to enroll in college, but then the course of her life was permanently altered by the birth of her daughter. As a single mom with no support network available to her, she took jobs working as a housekeeper in order to make ends meet, working days and taking college classes online by night. Hers is a story without safety nets or sick days, in which car trouble could result in eviction and homelessness, and food stamps become a necessity for survival. Land's eye-opening and oftentimes brutal memoir covers three years of her life as she worked low-paying, physically taxing jobs, navigated government assistance programs, and endured the public humiliation of asking for handouts. Through it all, she conveys just what it is like to live with the continual fear that life could be upended by a single unplanned expense, and bring an end to one's tenuous autonomy. Land's vivid, heart-rending prose provides a glimpse of single parenthood that is scarcely represented in literature, but what endures are the sacrifices a single mother is willing to give for the promise of a better life for her child. For fans of Heartland and Educated, this book is not to be missed.